Did Apple give gag orders to Apple Watch app developers? Apple Watch developers who attended clandestine development workshops in Cupertino this year have reportedly been sworn to secrecy regarding the wearable's capabilities. Apple has urged these app developers to zip their lips regarding what they're working on, according to 9 to 5 Mac, which allegedly spoke with multiple developers involved. Rather than promoting their apps ahead of time with details, screenshots and videos, or other materials and information, the devs apparently have to wait for Apple to reveal the Watch's final form on March 9. 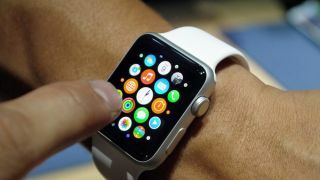 But even then they may not be free to discuss their work, as Apple has reportedly asked some developers to wait until late March or early April to reveal their Apple Watch applications. It seems Apple is intent not only on controlling all the messaging around the Apple Watch - which is definitely not surprising when it comes to Apple - but also on doing all the marketing for its key WatchKit developers. The iPhone maker also reportedly asked developers for code and assets to include in its March 9 presentation. A strong suite of apps is essential for any new product launch at this point, and it seems like the Apple Watch will have that right away - or, at least, Apple is going to do its best to make it seem that way.